One look at these beautiful, fresh blooms and you will undoubtedly fall in love! The orange Lily, Germinis, and Peach Roses are wonderfully contrasted by the purple Santini Chrysanthemums. 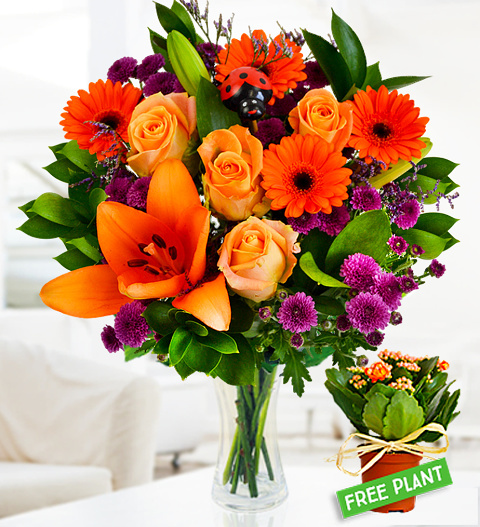 This bouquet is perfectly balanced with both bright colours and deeper tones. The textures of each flower also contrast in just the right way. This stunning bright bunch of flowers also comes with a happy Lady Bird pick which will give the recipient something extra to enjoy for years to come! Available for UK next day delivery, these blooms are great for any occasion! The arrangement comes with A FREE Kalanchoe plant measuring 15cm! Chocolates may contain nuts.